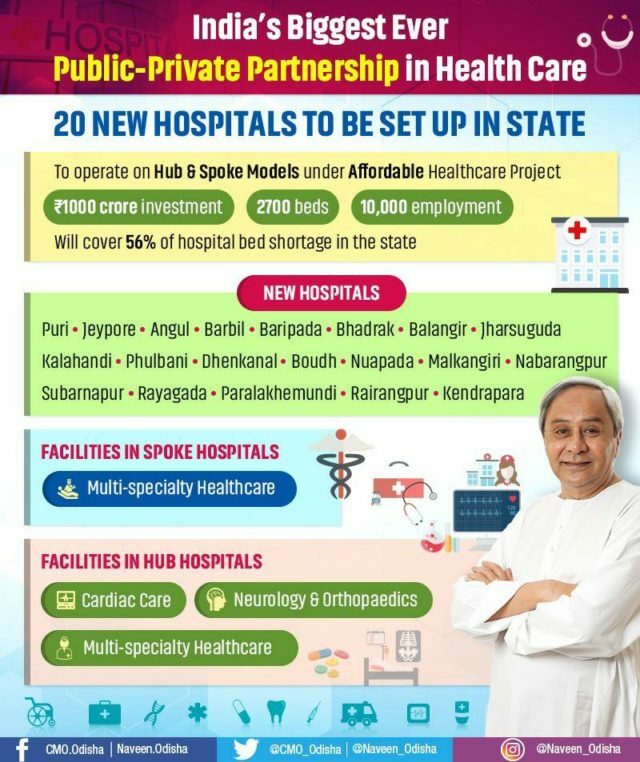 Bhubaneswar: Chief Minister Naveen Patnaik announced 20 new multi-speciality hospitals to be set up in state in the largest-of-its-kind Public Private Partnership initiative in India. With investment of ₹1000Cr, the hospitals will add 2700 beds & take best quality healthcare to people across the districts. • The hub and spoke model hospitals will be equipped with 2700 beds and will effectively cover 56% hospital bed shortage in the state. • Under Affordable Healthcare Project, these hospitals will also create 10,000 investment opportunities in healthcare sector. • The new hospitals will be set up in Puri, Jeypore, Angul, Barbil, Baripada, Bhadrak, Balangir, Jharsuguda, Kalahandi, Phulbani, Dhenkanal, Boudh, Nuapada, Malkangiri, Nabarangpur, Subarnapur, Rayagada, Paralakhemundi, Rairangpur and Kendrapara. • The hospitals will cover beneficiaries of various health insurance and assurance schemes along with select category patients availing Government assistance. The public-private partnership will transform healthcare sector in the state by providing advanced healthcare services to the people at the grassroots. Previous articleDoing voice over Data in the right way!